Interesting release from Rice involving graphite and nanotechnology, but not the usual carbon nanotubes, graphene or graphane. Advances by the Rice University lab of James Tour have brought graphite’s potential as a mass data storage medium a step closer to reality and created the potential for reprogrammable gate arrays that could bring about a revolution in integrated circuit logic design. In a paper published in the online journal ACS Nano, Tour and postdoctoral associate Alexander Sinitskii show how they’ve used industry-standard lithographic techniques to deposit 10-nanometer stripes of amorphous graphite, the carbon-based, semiconducting material commonly found in pencils, onto silicon. This facilitates the creation of potentially very dense, very stable nonvolatile memory for all kinds of digital devices. Graphite makes a good, reliable memory “bit” for reasons that aren’t yet fully understood. The lab found that running a current through a 10-atom-thick layer of graphite creates a complete break in the circuit — literally, a gap in the strip a couple of nanometers wide. Another jolt repairs the break. The process appears to be indefinitely repeatable, which provides addressable ones and zeroes, just like today’s flash memory devices but at a much denser scale. Graphite’s other advantages were detailed in Tour’s earlier work: the ability to operate with as little as three volts, an astoundingly high on/off ratio (the amount of juice a circuit holds when it’s on, as opposed to off) and the need for only two terminals instead of three, which eliminates a lot of circuitry. It’s also impervious to a wide temperature range and radiation; this makes it suitable for deployment in space and for military uses where exposure to temperature extremes and radiation is a concern. Tour’s graphite-forming technique is well-suited for other applications in the semiconductor industry. One result of the previous paper is a partnership between the Tour group and NuPGA (for “new programmable gate arrays”), a California company formed around the research to create a new breed of reprogrammable gate arrays that could make the design of all kinds of computer chips easier and cheaper. The Tour lab and NuPGA, led by industry veteran Zvi Or-Bach (founder of eASIC and Chip Express), have applied for a patent based on vertical arrays of graphite embedded in “vias,” the holes in integrated circuits connecting the different layers of circuitry. When current is applied to a graphite-filled via, the graphite alternately splits and repairs itself (a process also described in the latest paper), just like it does in strip form. Essentially, it becomes an “antifuse,” the basic element of one type of field programmable gate array (FPGA), best described as a blank computer chip that uses software to rewire the hardware. Currently, antifuse FPGAs can be programmed once. But this graphite approach could allow for the creation of FPGAs that can be reprogrammed at will. Or-Bach said graphite-based FPGAs would start out as blanks, with the graphite elements split. Programmers could “heal” the antifuses at will by applying a voltage, and split them with an even higher voltage. Such a device would be mighty handy to computer-chip designers, who now spend many millions to create the photolithography mask sets used in chip fabrication. If the design fails, it’s back to square one. “As a result of that, people are only hesitantly investing in new chip designs,” said Tour. “They stick with the old chip designs and make modifications. FPGAs are chips that have no specific ability, but you use software to program them by interconnecting the circuitry in different ways.” That way, he said, fabricators don’t need expensive mask sets to try new designs. “The No. 1 problem in the industry, and one that gives an opportunity for a company like ours, is that the cost of masks keeps moving up as people push semiconductors into future generators,” said Or-Bach. “Over the last 10 years, the cost of a mask set has multiplied almost 10 times. A double dose of graphene news for tonight. Berkeley — Today’s transistors and light emitting diodes (LED) are based on silicon and gallium arsenide semiconductors, which have fixed electronic and optical properties. Now, University of California, Berkeley, researchers have shown that a form of carbon called graphene has an electronic structure that can be controlled by an electrical field, an effect that can be exploited to make tunable electronic and photonic devices. While such properties were predicted for a double layer of graphene, this is the first demonstration that bilayer graphene exhibits an electric field-induced, broadly tunable bandgap, according to principal author Feng Wang, UC Berkeley assistant professor of physics. The bandgap of a material is the energy difference between electrons residing in the two most important states of a material – valence band states and conduction band states – and it determines the electrical and optical properties of the material. “The real breakthrough in materials science is that for the first time you can use an electric field to close the bandgap and open the bandgap. 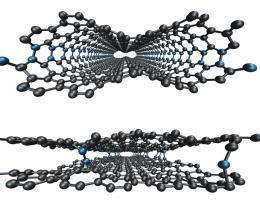 No other material can do this, only bilayer graphene,” Wang said. Because tuning the bandgap of bilayer graphene can turn it from a metal into a semiconductor, a single millimeter-square sheet of bilayer graphene could potentially hold millions of differently tuned electronic devices that can be reconfigured at will, he said. Wang, post-doctoral fellow Yuanbo Zhang, graduate student Tsung-Ta Tang and their UC Berkeley and Lawrence Berkeley National Laboratory (LBNL) colleagues report their success in the June 11 issue of Nature. Graphene is a sheet of carbon atoms, each atom chemically bonded to its three neighbors to produce a hexagonal array that looks a lot like chicken wire. Since it was first isolated from graphite, the material in pencil lead, in 2004, it has been a hot topic of research, in part because solid state theory predicts unusual electronic properties, including a high electron mobility more than 10 times that of silicon. However, the property that makes it a good conductor – its zero bandgap – also means that it’s always on. Semiconductors, for example, can be turned off because of a finite bandgap between the valence and conduction electron bands. While a single layer of graphene has a zero bandgap, two layers of graphene together theoretically should have a variable bandgap controlled by an electrical field, Wang said. Previous experiments on bilayer graphene, however, have failed to demonstrate the predicted bandgap structure, possibly because of impurities. Researchers obtain graphene with a very low-tech method: They take graphite, like that in pencil lead, smear it over a surface, cover with Scotch tape and rip it off. The tape shears the graphite, which is just billions of layers of graphene, to produce single- as well as multi-layered graphene. Wang, Zhang, Tang and their colleagues decided to construct bilayer graphene with two voltage gates instead of one. When the gate electrodes were attached to the top and bottom of the bilayer and electrical connections (a source and drain) made at the edges of the bilayer sheets, the researchers were able to open up and tune a bandgap merely by varying the gating voltages. The team also showed that it can change another critical property of graphene, its Fermi energy, that is, the maximum energy of occupied electron states, which controls the electron density in the material. “With top and bottom gates on bilayer graphene, you can independently control the two most important parameters in a semiconductor: You can change the electronic structure to vary the bandgap continuously, and independently control electron doping by varying the Fermi level,” Wang said. Because of charge impurities and defects in current devices, the graphene’s electronic properties do not reflect the intrinsic graphene properties. Instead, the researchers took advantage of the optical properties of bandgap materials: If you shine light of just the right color on the material, valence electrons will absorb the light and jump over the bandgap. In the case of graphene, the maximum bandgap the researchers could produce was 250 milli-electron volts (meV). (In comparison, the semiconductors germanium and silicon have about 740 and 1,200 meV bandgaps, respectively.) Putting the bilayer graphene in a high intensity infrared beam produced by LBNL’s Advanced Light Source (ALS), the researchers saw absorption at the predicted bandgap energies, confirming its tunability. Because the zero to 250 meV bandgap range allows graphene to be tuned continuously from a metal to a semiconductor, the researchers foresee turning a single sheet of bilayer graphene into a dynamic integrated electronic device with millions of gates deposited on the top and bottom. “That would be the dream in the future,” Wang said. Depending on the lithography technique used, the size of each gate could be much smaller than one micron – a millionth of a meter – allowing millions of separate electronic devices on a millimeter-square piece of bilayer graphene. Wang and Zhang also foresee optical applications, because the zero-250 meV bandgap means graphene LEDs would emit frequencies anywhere in the far- to mid-infrared range. Ultimately, it could even be used for lasing materials generating light at frequencies from the terahertz to the infrared. “It is very difficult to find materials that generate light in the infrared, not to mention a tunable light source,” Wang said. Crommie noted, too, that solid state physicists will have a field day studying the unusual properties of bilayer graphene. For one thing, electrons in monolayer graphene appear to behave as if they have no mass and move like particles of light – photons. In tunable bilayer graphene, the electrons suddenly act as if they have masses that vary with the bandgap. “This is not just a technological advance, it also opens the door to some really new and potentially interesting physics,” Crommie said. Wang, Zhang, Tang and their colleagues continue to explore graphene’s electronic properties and possible electronic devices. Their coauthors are Crommie, Alex Zettl and Y. Ron Shen, UC Berkeley professors of physics; physics post-doctoral fellow Caglar Girit; and Zhao Hao and Michael C. Martin of LBNL’s ALS Division. Zhang is a Miller Post-doctoral Fellow at UC Berkeley. University of Chicago scientists have induced electrons in the nanocrystals of semiconductors to cool more slowly by forcing them into a smaller volume. This has the potential to improve satellite communications and the generation of solar power. Guyot-Sionnest is the principal investigator on the research project, which was described in a paper called “Slow Electron Cooling in Colloidal Quantum Dots,” published Nov. 7 in Science. Slower cooling of electrons in nanocrystals was first theorized in 1990, but no one has been able to observe this effect. Slow electron cooling in nanocrystals occurs because forcing the electrons into a smaller volume leads them to oscillate between their alternate extremes within a very short period of time. (This is analogous to the way shorter strings on musical instruments produce higher pitches.) The electrons in the nanocrystals used in this experiment oscillated so fast that it became difficult for them to drag along the more sluggish vibrations of the nuclei. As a result, the energy stayed with the electrons for a longer period of time. The slower cooling effect was difficult to induce and observe because several different mechanisms for energy loss interfered with the process. By eliminating these other mechanisms, the researchers were able to induce and observe slower electron cooling in nanocrystals. Anshu Pandey, a graduate student in Chemistry at the University of Chicago, did the experiments described in the Science paper, which he co-authored.